Alan Turing, the remarkable computer pioneer and codebreaker, worked at Bletchley Park during the Second World War and helped the allies to break the enigma code. Despite his service to his country, a post-war Turing was ostracised, shunned, and prosecuted under the notorious anti-homosexual section 11 of the Criminal Law Amendment Act. The Edinburgh debut of Scriptography Productions’ staging follows hot on the heels of the 2014 film bio-pic The Imitation Game, and notably the issuing of a posthumous Royal pardon in 2013 apologising for the treatment of Turing, a mere 59 years after his death by alleged suicide. Catrin Fflur Huws’ script begins with this royal pardon, delivered by two maniacally beaming government officials as they wring their hands and attempt (unsuccessfully) to stifle their cruel laughter whilst describing the trials endured by the brilliant mathematician. Episodes from Turing’s life are intercut with a gaudy and macabre duo of TV hosts, relishing in the anguish of the play's protagonist and abuzz with energy and vigour. The Turing Test, a thought-experiment in which unseen participants attempt to convincing deceive the others of their gender (or indeed their humanity), is imagined as a Machiavellian game-show and a painfully biting metaphor for Turing's inability or unwillingness to imitate the sexual and social customs of his time. In alternating between the game-show and scenes of Gydion Rhys’ stammering, reedy and quietly understated Turning, To Kill a Machine encounters a problem of pacing: the tone has little variation, restricting the production to the broader strokes rather than nuanced reflection. 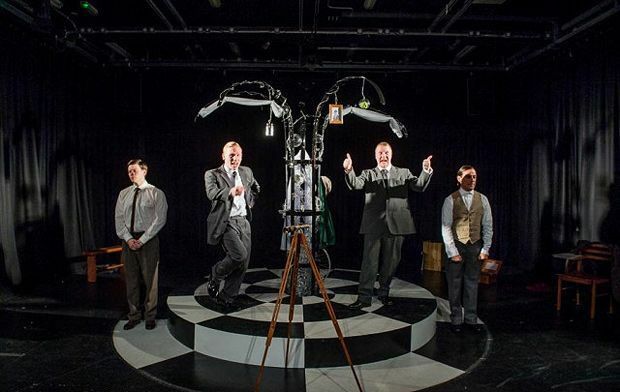 Cordelia Ashwell’s set has the four-strong ensemble encircling a metal pylon of twisted wire, tangled with remembrances of Turing’s past and slung with references to his untimely and symbol laden death; an alleged bite of a poisoned apple. To Kill a Machine neatly weaves themes of humanity, machinery, and the principles of imitation in social interaction throughout the piece and the ensemble wheel about the stage, manipulating one other in bursts of raw physicality. We are left in doubt as to cruelty of the machinations at work around Turing, as embodied by the lingering audience of government officials, to them the timid and brilliant young man with ‘a machine-like mind’ is exactly that, a machine, and one that they intend to dispose of once its purpose is served. In paring back their material to focus on Turing as a man, rather than on his war-time achievements, To Kill a Machine allows its themes to take centre stage, with Turing’s ‘machine-like’ mind serving to further his dislocation from the world around him. When the staging is in its more expressionistic moments, this produces some taut and interesting imagery, at other points however this leads to characters straining as the mouthpieces for themes. There is much to admire in Angharad Lee’s staging, in particular the tender yet tragic sensuality of Turing and Arnold Murray (Rick Yale) which is only intensified by an implication of entrapment on Murray’s part. Yet for all its righteous anger and poignancy, To Kill a Machine struggles to breathe life into its characters, at times falling on a reliance of stock phrases and expositional questions to move scenes forward.